Google News Spotlight Section: "Did Not Match Any Documents"
The Google News Spotlight section, which launched about a year ago seems to be having some technical difficulties. Some users are reporting in the Google News Help forum that it doesn't return any matched documents. The specific error reads, "Your search - Spotlight - did not match any documents." Our team has been made aware of the issue and is working to resolve it as quickly as possible. What does the spotlight section do? 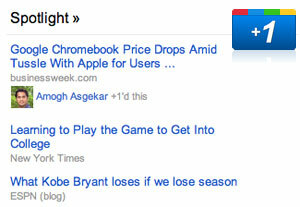 The Spotlight section of Google News is updated periodically with news and in-depth pieces of lasting value. These stories, which are automatically selected by our computer algorithms, include investigative journalism, opinion pieces, special-interest articles, and other stories of enduring appeal. To access the stories in this section, just click Spotlight on the left side of the page. It works for me, so maybe it only impacts some people or maybe Google fixed it as of this morning?